Let's Go Caps! 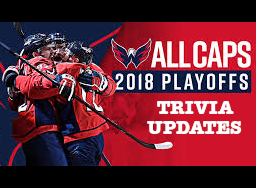 The Caps are competing for the Stanley Cup for the first time in 20 years. Many venues are hosting watch parties and will not be holding their normally scheduled trivia event (don't worry! they'll be back when playoffs are over!). Please see the chart below for details - all venues not listed are ON as normal. Venues listed for games 6, & 7 will only be cancelled if those games are played.